With a population of 416,857 (of an estimated population of 6.3 million) fleeing their country in 2014 in search of international protection, Eritrea has been awarded notorious membership of the cluster of states sending out the highest number of asylum seekers throughout the world (UNHCR data). However, the Eritrean diaspora was only granted the importance it deserves last June when the Human Rights Council of the United Nations presented the report of a Commission of Inquiry on human rights in Eritrea. The document alarmingly claims the existence of grave human rights violations in the East-African state, which result, according to the commissioners, from the “initial desire to protect and ensure the survival of the young State” but which “very quickly degenerated into the use of totalitarian practices aimed at perpetuating the power of the Eritrean People’s Liberation Front (EPLF) and its successor, the People’s Front for Democracy and Justice (PFDJ)”. Since Eritrea gained independence in 1993, the PFDJ has ruled over the country without interruption, despite the time limit of each government mandate set by the UN in the aftermath of independence. The 550 first-hand confidential interviews conducted by the Commission of Inquiry have unequivocally depicted a system of “widespread and gross human rights violations […] committed under the authority of the government” led by Isaias Afewerki and in power since the 1993 state independence. Repression, control, silence and isolation are the key words in understanding the situation most Eritreans are forced to live in. The report seems to portray a truly paranoid leadership obsessed with the threat posed by alleged political opposition and renegade citizens. The impression is that of an establishment that is equally terrorized by its population and by everything placed outside of its borders. The only solution henceforth is to hamper any citizen’s freedom, enforce slavery-like labor and a pervasive system of control over the population. 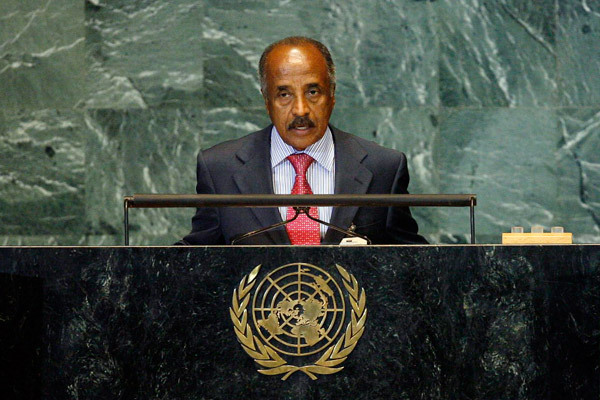 Omnipresence surveillance lies at the core of Afewerki’s grip on the Eritrean population; the general climate of fear, sustained by harassment and intimidation of every kind, has disruptive consequences on the social and even familial fabric. Enforced disappearance, detention and arbitrary deprivation of life are then the common solutions envisaged by the repressive filo-governmental system that operates daily in Eritrea. Due to a lack of division of powers, the judiciary falls under the control of the executive, with the consequence of hampering the right to a fair trial. Detainees are usually victims of severe ill treatment and torture. The most fundamental rights – such as freedom of movement, of expression, of press, of assembly and religion – are strongly curtailed for the Eritrean people, who are severely punished when they attempt to break the rule of fear institutionalized by the government. Lastly, conscription deserves to be mentioned, as being one of the most despicable elements of Afewerki’s system. Every Eritrean is forced to do military service, which is indeed a true example of semi-slavery and forced labor. The conditions in which the conscripted live are particularly harsh, and include lack of adequate food, water, hygienic facilities, accommodation and medical services that may result in death, severe disabilities and psychological and physiological long-term effects. Sexual violence against women and girls is widespread and indeed notorious in military training camps. The report has had a strong impact on the EU Member States in recognizing the status of refugees for the many Eritreans fleeing to Europe. Would we need such a report for every country whose tragedies still lie untold? © 2015 The Asylum Corner is a property of Lai‑momo. Check out what we do!